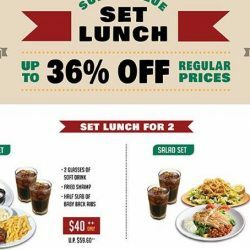 Till 30 Nov 2018 Tony Roma’s: Enjoy Up to 30% OFF & Buy 2 Get 1 FREE Main Course with Coupons! 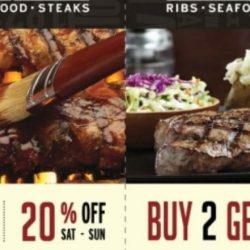 Enjoy ribs and steaks at Tony Roma's with these offers! Get 30% off on weekdays, 20% off on weekends or buy 2 get 1 free main course when you present these coupons! Valid for dine-in only till 30 November 2018. 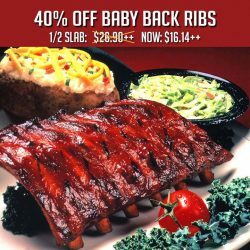 Till 30 Apr 2018 Tony Roma’s: Enjoy Up to 40% OFF Half Slab of Baby Back Ribs when You Show This EDM! 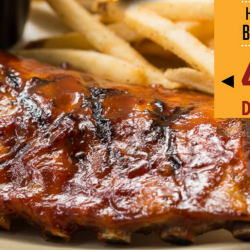 Enjoy a 40% Discount on a half slab of Tony Roma's world famous original Baby Back Ribs from Monday to Thursday! The usual price is $26.90++ and you can get it for only $16.14++. 30% discount applies from Friday to Sunday! Valid till 30 April 2018. Limited Time Only! 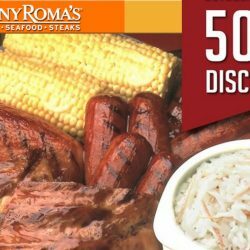 Tony Roma’s: Pay only 50% for Tony Roma’s Vouchers! 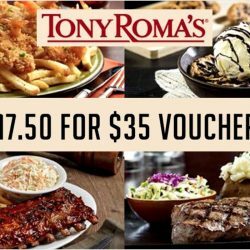 For a limited time only, get a $35 Tony Roma's Voucher at $17.50 only available exclusively at Qoo10! That's 50% off! Valid for dine-in only from now till 9 December 2016, Monday to Friday. You can purchase multiple vouchers for per visit use but 2 entrees must be purchased for use of each voucher. Use your Qoo10 coupons to save even more! 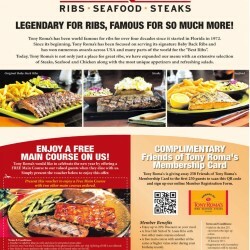 Just for this October only, enjoy a 50% Discount when you dine at any Tony Roma's restaurant in Singapore. With a minimum spend of $50++, they will remove $25 off your bill. Present this eDM to enjoy the offer! 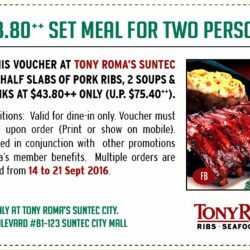 In conjunction with the Singapore Grand Prix, Tony Roma's Suntec is offering a Set Meal for 2 for only $43.80++ (U.P. $75.40++) from 14 to 21 September 2016. Each Set Meal comes two Half slab of Pork Ribs, two glasses of soft drink and 2 bowls of soup. Download and present voucher to enjoy this fabulous offer! Enjoy Tony Roma's mouth-watering pork ribs from the comfort of your office or home with our delivery partner, Deliveroo. 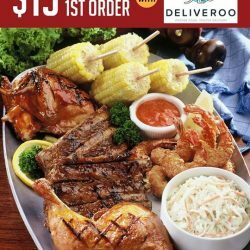 From now till 20th September, enjoy $15 off your first delivery order by providing the discount code when you're ordering online. 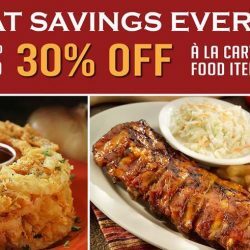 Till 30 June 2016 Tony Roma’s: 20% OFF For Those Born in June! 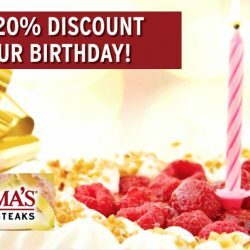 Tony Roma's FB birthday offer is back! Enjoy 20% off your total bill if you are celebrating your birthday in June when you show this FB post to their staff! Valid till 30 June 2016. 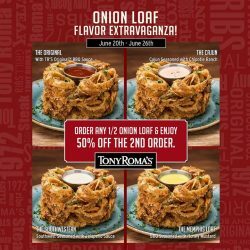 Come celebrate National Onion Rings Day at Tony Roma's from June 20th to June 26th. Order a Half Onion Loaf and enjoy the second order at 50% Discount. To commemorate this special occasion, we've added three new sauces (Cajun, Southwestern and Memphis) in addition to our original BBQ sauce to our delectable onion loaf. Come check it out. You'll not be disappointed. 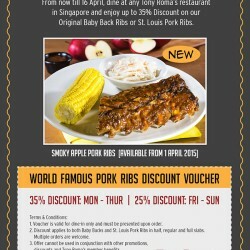 From now until 16 Apr 2015, dine at any Tony Roma’s restaurant in Singapore and enjoy up to 35% discount on their Original Baby Back Ribs or St. Louis Pork Ribs. Legendary for Ribs, Famous for so much more! TonyRoma's offers Free Main Course Voucher until 12th February 2015.